Former Ukraine Prime Minister Yulia Tymoshenko is delivering a stirring speech to protesters from her wheelchair in Kiev. WASHINGTON - The United States on Saturday welcomed the release from prison of former Ukrainian Prime Minister Yulia Tymoshenko and pledged to work with Russia and European and international organizations to support a unified and democratic Ukraine. "We have consistently advocated a de-escalation of violence, constitutional change, a coalition government, and early elections, and today's developments could move us closer to that goal," the White House said in a statement. MOSCOW - Russian Foreign Minister Sergei Lavrov told U.S. Secretary of State John Kerry on Saturday that the peace deal signed in Ukraine had been "sharply degraded by opposition forces' inability or lack of desire" to respect it, the ministry said. "Illegal extremist groups are refusing to disarm and in fact are taking Kiev under their control with the connivance of opposition leaders," Lavrov told Kerry by telephone, according to a Russian Foreign Ministry statement. Lavrov "reminded" Kerry that President Vladimir Putin had urged U.S. President Barack Obama during an earlier call to "use every opportunity to stop the illegal actions of radicals and return the situation to constitutional channels", it said. MOSCOW - Russian President Vladimir Putin's envoy to Ukraine on Saturday criticized the European Union ministers who helped broker a peace deal in Kiev. "I do not understand, frankly, how after recognizing the legitimacy of President Yanukovich, the parliament, all the state structures, my European colleagues can then come to Kiev and go to the nationalist-revolutionary and terrorist Maidan and say there - down with the government they recognized," Lukin said in a television interview. The deal between Russia-backed President Viktor Yanukovich and the opposition was brokered by the foreign ministers of France, Poland and Germany. Reader Comment: Will Yulia Tymoshenko consider running for President? Jailed Ukrainian opposition leader Yulia Tymoshenko will soon be released in the northeastern city of Kharkiv, where she is being treated in hospital. 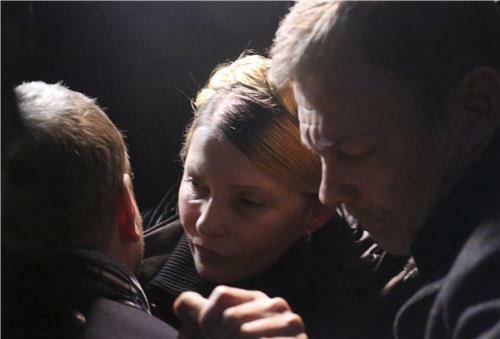 Yevgenia Tymoshenko said she was going to Kharkiv to meet her mother, who was jailed in 2011 for seven years for abuse of office linked to a gas deal and is a bitter rival of President Viktor Yanukovich. Embattled Ukrainian President Viktor Yanukovich said he had no intention of resigning or leaving Ukraine, saying all decisions taken by parliament on Saturday were illegal, Interfax reported citing a television interview. The report did not specify his whereabouts but a dateline on the television interview read Kharkiv, a city in northeastern Ukraine. Russian Foreign Minister Sergei Lavrov discussed the Ukraine peace deal with European Union foreign policy chief Catherine Ashton and urged the EU to condemn "radicals" responsible for violence, his ministry said on Friday. A ministry statement said Lavrov and Ashton had discussed the deal "and the prospects for its implementation in the conditions of continuing activity by extremist forces", suggesting Moscow had doubts it could succeed. "Sergei Lavrov has decisively denounced the activities of radicals who bear the full responsibility for the violence and human casualties and urged the EU and its member-states to clearly express rejection of these activities," it said. "We will not celebrate, we will be peaceful, because of what's happening in our nation," Sergey Bubka, Ukraine's Olympic head, told reporters as he fought back tears. Ukrainian President Viktor Yanukovich on Friday signed an agreement with three opposition leaders on ending a crisis that sparked bloody clashes between protesters and police on the streets of the capital Kiev. The deal sets out plans to hold early presidential elections, form a national unity government and revert to the 2004 constitution, removing some of the president's powers. A Reuters correspondent at the signing in the presidential headquarters said Yanukovich did not smile during a ceremony lasting several minutes but he did shake hands with the opposition. Kiev - Ukraine's parliament on Friday voted heavily in favor of returning to the constitution of 2004 under which President Viktor Yanukovich will lose some of his powers. The constitutional move was part of an EU-brokered agreement signed between Yanukovich and opposition leaders to end a crisis which has sparked mass street protests and violence in the capital Kiev. It remains important that those responsible for killings and human rights violations in Ukraine are brought to justice. Congratulations on political agreement now signed in Kiev. New government with new powers must now tackle also massive economic challenges. 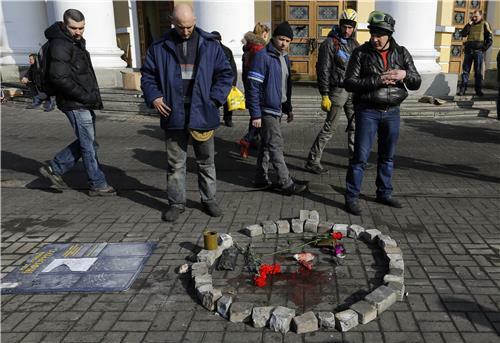 Let's all remember that #euromaidan protesters were never super keen on #Ukraine opp. leaders. Or deals. 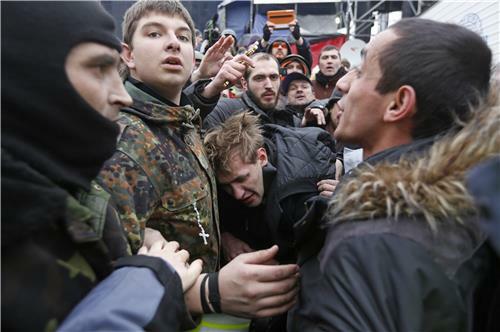 Disgusted with #Ukraine #Euromaidan Protest leaders. 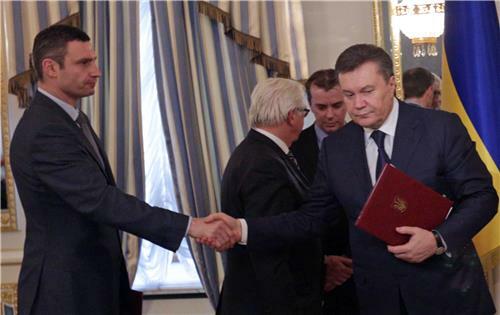 Signed agreement which leaves murderer #Yanukovych in power. People died for nothing. 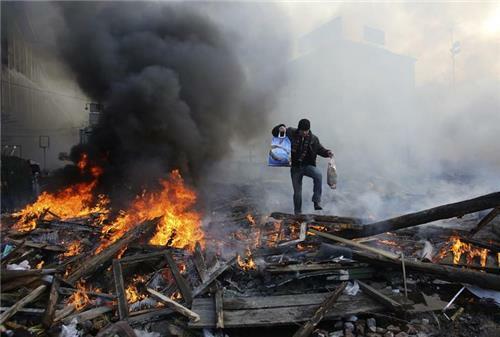 Yanik wants #euromaidan to pack up and go away. It's a victory for him. Betrayal by the "leaders"